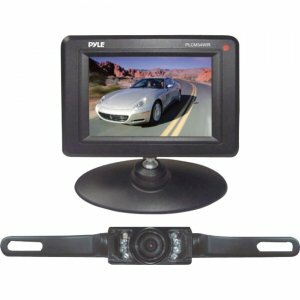 This kit includes a nightvision-capable rear view camera and monitor for your vehicle. The rear view camera mounts easily above your license plate and outputs crystal clear video over an RCA jack. And there's no wiring required - this system is wireless, so you'll be able to see behind you on the included 3.5" monitor in your car in a flash! Perfect for backing into tight spots or moving in reverse when visibility is limited - it's like having an extra eye. And this model comes with nightvision LEDs, which illuminate the area behind you at night. This small and durable unit will keep you safe and secure because you'll always know what's going on around you.